When I cooked the Beef with Bittermelon Stirfy, I had to cook something else that the girls would eat. So this one, I cooked exactly the same way as the bittermelon stirfy but with different vegetables. Stir the cornstarch into ¼ cup of water until dissolved and set aside. Heat a skillet or wok and add 2 tablespoons of oil. Add the beef and stir fry in high heat until it changes color. Remove beef from the wok and set aside. If there in not enough oil left in the pan, you can add another tablespoon. Stir fry the garlic, ginger and onions until fragrant. Add the broccoli, corn and oyster sauce and stir fry for a minute or two. Add the stirfried beef back and stir. Add the peppers and the cornstarch mixture, stir and let cook for another couple of minutes. Adjust the seasoning, add more oyster sauce or salt if necessary, and remove from the heat. 2 Tbsp. Oil (+1 Tbsp. as needed)Stir the cornstarch into 1/4 cup of water until dissolved and set aside. Heat a skillet or wok and add 2 tablespoons of oil. Add the beef and stir fry in high heat until it changes color. Remove beef from the wok and set aside. If there in not enough oil left in the pan, you can add another tablespoon. Stir fry the garlic, ginger and onions until fragrant. 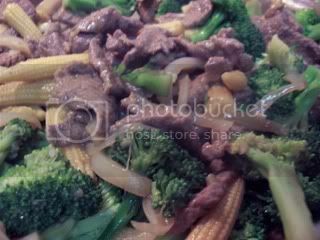 Add the broccoli, corn and oyster sauce and stir fry for a minute or two. Add the stirfried beef back and stir. Add the peppers and the cornstarch mixture, stir and let cook for another couple of minutes. Adjust the seasoning, add more oyster sauce or salt if necessary, and remove from the heat. Serve with steamed rice. This is my dad’s favorite dish!